Hounslow is situated in West London, close to Heathrow, Richmond and Kingston upon Thames. Located close to the M25, Hounslow offers excellent transport links to the rest of the UK, making this an ideal location for warehouse owners and businesses looking for warehousing solutions. Many storage Hounslow solutions can be found in the area providing a range of warehousing services and order fulfillment services such as pick and pack, pallet storage, bulk storage, warehouse loading bay facilities, an invoice service, cold storage, frozen storage, CCTV surveillance, import export services, pharmaceuticals storage, stock management as well as warehouse space for lease and much more. Whether you are an established company or a start-up firm, if selling commercial goods, warehousing will be an important part of your business. Finding a suitable warehouse company to deal with your storage, distribution and perhaps pick and pack services, is vital to the success of your business. Having the confidence in the logistics company you use enables you to concentrate on increasing sales and ultimately growing your business. If you are a business which deals with importing your goods and then sending out smaller orders, then pick and pack will play an important part in your supply chain needs. Many third party logistics companies (3PL) are able to assist in this and offer anything from simple storage and then picking the goods ready for distribution to unloading your goods from the trailer when they arrive from abroad, putting them to store, picking and packing the goods when orders are received and dispatching them to your customers. 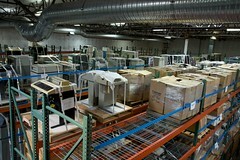 Both nationwide and international distribution is available for some of the warehouses listed below. Stock control of your goods and the rework of the goods and returns may also be available. One of the warehouses featured below is also MHRA approved, to handle medicines and healthcare products if required. Whichwarehouse lists many warehouse companies in the UK which would be able to assist with your warehousing requirements. To check for current availability of 3PL companies in the London area contact us today. We can even assist with finding you suitable warehouse space to operate yourself. Whatever your warehousing needs, Whichwarehouse can point you in the right direction. Call one of our team today on 0800 1707 555 or click here and we can obtain some no-obligation quotes for you to consider.